In Chap. 6, we explained the concept of financial feasibility for a real estate development, described the front-door and back-door analyses in detail, and gave a simple example of each. One of the characteristics of the front-door analysis is that it only considers one specific location. However, housing could potentially be built in any place, and each site is different. How do we take account of the fact that building five miles from a city center is entirely different from building two miles from the city center? To address this question, this chapter extends the front-door analysis to make the location a choice variable, so that the model analyzes feasibility in any location. First, we briefly review the underlying economic model that describes how rents and land prices vary with location. 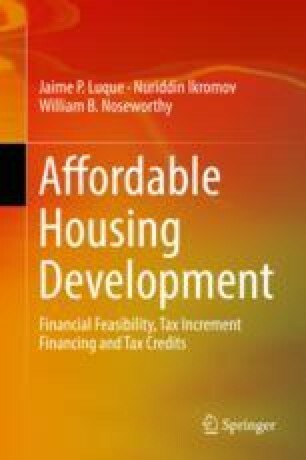 Next, we develop a numerical example that will explore the feasibility of affordable housing development in multiple locations in a city. The model will show that it is incredibly challenging to make affordable housing “work” without subsidies or tax credits. In Chap. 8, we will continue building on the numerical example to show how subsidies can help make previously infeasible projects feasible.